Movie people have the Oscars. Stage actors and actresses have the Tonys. Recording artists have the Grammys. And disruptive breast cancer bloggers have the MAAMies. It’s a Major Award! The I Hate Breast Cancer Foundation (IHBCF) is pleased to announce the winners of the first ever MAAM (Mammogramatically Challenged And/Or Also Metsters ) of the Year Awards. As a global leader in truth, justice and the anti-carcinogenic way, the IHBC Foundation is pleased to recognize the few, the proud and the very loud breast cancer bloggers. Winners: The Prize Patrol will find you. 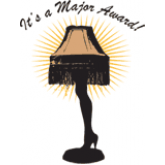 Each of you will be receiving a Major Award individually selected for you. Please send your mailing address to kob [at]americanprinter.com. The Queen of Snark is “informative, funny beyond words and just the most beautiful person, evah!” according to nominator Bethany. The Accidental Amazon has a way with words AND pictures. “Katie strikes a dissonant chord with many advocates and concerned citizens about the lengths fundraisers will go in the name of the cause,” author Gayle Sulik observed. Katie has the unique distinction of being banned from the “Feel Your Boobies” Facebook page, apparently for expressing inconvenient truths. This award is given to those who personify awareness and education in action. Inflammatory Breast Cancer (IBC) accounts for between 1 to 5 percent of all U.S. breast cancer cases–NIH classifies it as a rare disease. Although some progress has been made, it remains the most aggressive type of breast cancer. Both JDub and Elizabeth Danu have written extensively about IBC. They have compiled useful resources, shared their own experiences and reached out to the others. A lot of people talk about awareness but Elizabeth and “Gertrude” actually are creating some. Thanks to ALL who are making a difference. We owe a debt of gratitude to Daria, RivkA and so many who have preceded us. Thanks for showing us the way. Wow.!!! I really wasn’t expecting this. Thank you and Thank you to Anna, Katie, Ann and Kathi for being the bloggers we all wish we could be. We linked to many of you a while back, but NOW I really got to know you at the NBCC. You are awesome and amazing women. Proud, proud, proud. *Races to podium for trite acceptance speech* NOTE: Appears at podium WITHOUT pink ribbon prominently placed somewhere on body. And I’d also like to thank my Dad, without whom I’d never be who I am today, nor BRCA1+. I’d also like to thank the pharmaceuticals for sponsoring my appearance here today, and in fact my continued existence and for all the colonic adventures, eternal baldness, nameless skin irritations, zombie like-skin palor, and depressed blood counts, oh but I’m sure I’m forgetting something…….well thank you to all side-effects for enriching my life and allowing me to continue to ply my snarky craft. You make me a less better person and my doctors richer. And I’d to thank you, my minions, my disciples, my groupies, my followers, my fans, nay my friends from the bottom of my heart, which incidentally now sports a pericardial window which also goes beautifully with my dress. Tonight I’m wearing Komen Coture for the Cure. (Please don’t reprint the name of the dress label without my express permission, and a royalty would be nice as well, otherwise expect a lawsuit). I would also like to thank my tumors who everyday give me the the encouragement to get out of bed and give the appropriate tongue lashings. Without them I’d be…..oh I don’t know, who knows where, but I certainly wouldn’t be here to accept this prestigious MAAM award today without their continued support and growth within my bodily ecosystem. You should thank your fans! My friend Bonnie did: the one in the kitchen, the one in bedroom, the one in the living room etc., Hot flashes–they’re a fashion don’t! What amazing writers and incredible PEOPLE! I’m so happy to have met you #cancerrebels in person at NBCCATC – YOU ROCK! Ah thank you for this. Sheesh, am sure glad we can laugh about all this stuff! I’m so honored to “know” these amazing women who have earned this distinguished award. I am even more proud to have been a part of the equally important nominating process. After all, you can’t win if you aren’t nominated, right? Love the humble acceptance speeches too! Thanks for the laughs, Katherine! Great choices. Sometimes hilarious and always on point! Love your idea for the awards. Well done, ladies, but really, we need to find a new co-star–breast cancer. FANTASTIC!!!!! Let the rebellion continue. Winning with a representative post about Sarah is a true honor.